"Make sure to monitor the welfare and protection of every Overseas Filipino Workers (OFW) you deploy abroad." 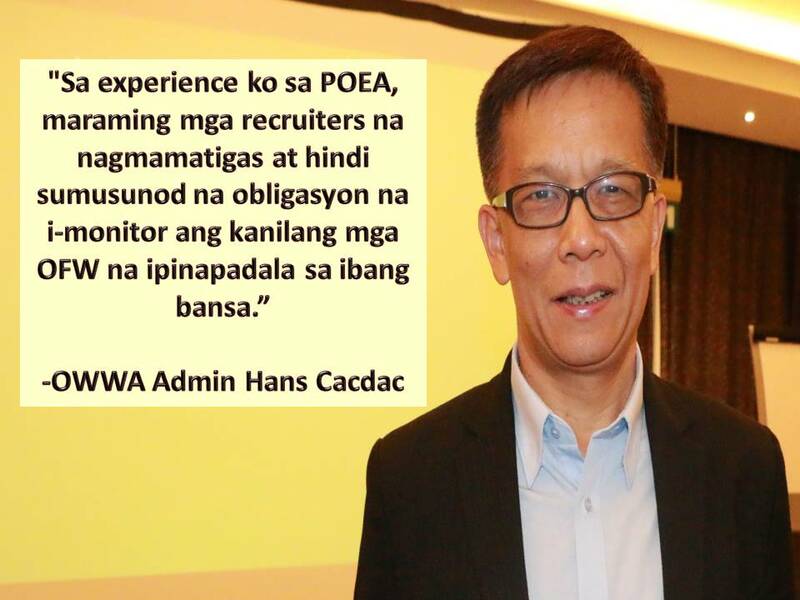 This is the word of Overseas Workers Welfare Administration (OWWA) Administrator Hans Leo Cacdac to recruitment agencies. Cacdac noted that recruitment agencies must respect human and employment rights, as well as ethical recruitment processes prior to worker's deployment. “People are recruited out of poverty, not because of their skills, not because they have been properly matched,” said Cacdac. This is after the Philippines broke the 2-million mark last year with 2,112,331 workers. With this, 80 percent are land-based while 20 percent are sea-based. Saudi Arabia is still the number one destination for Filipino migrant workers, followed by the United Arab Emirates (UAE), Singapore, Qatar and Hong Kong. With this number 47 percent of this are household service workers. Cacdac said there must be tighter regulations in terms of looking into how domestic workers are interviewed, qualified, trained, informed, and deployed. He said obligation of recruitment agencies to monitor workers is in the rules and regulation of the Philippine Overseas Employment Administration (POEA) for the last 25 years. 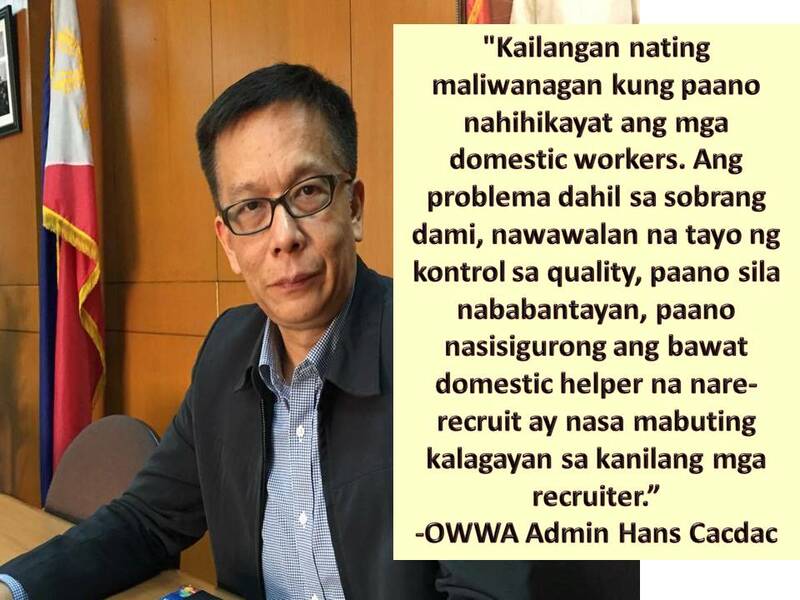 The OWWA chief cited as an example a household service worker who Labor Secretary Silvestre Bello visited in Saudi Arabia last year. He said the OFW was badly beaten and brought to a hospital in a coma. She passed away about a week after the visit, Cacdac said. “But she was a worker who only had been in Saudi for three weeks, and then that happened. Now, if the recruiter, in this case, would simply monitor or had monitored her from the time she arrived, then we could have saved her life,” Cacdac said. The recruiter, he said, was initially penalized with a yearlong suspension. Its license was eventually canceled. 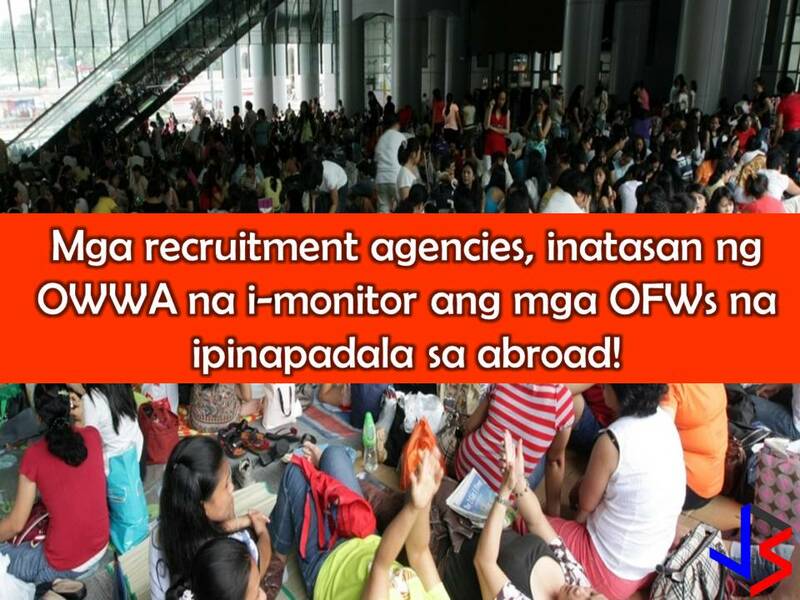 The governing board passed a rule that directs every recruitment agency to have a welfare desk and a welfare officer assigned to monitor OFWs it had deployed. He also highlighted the need for an effective coordination with foreign counterparts of recruitment agencies. 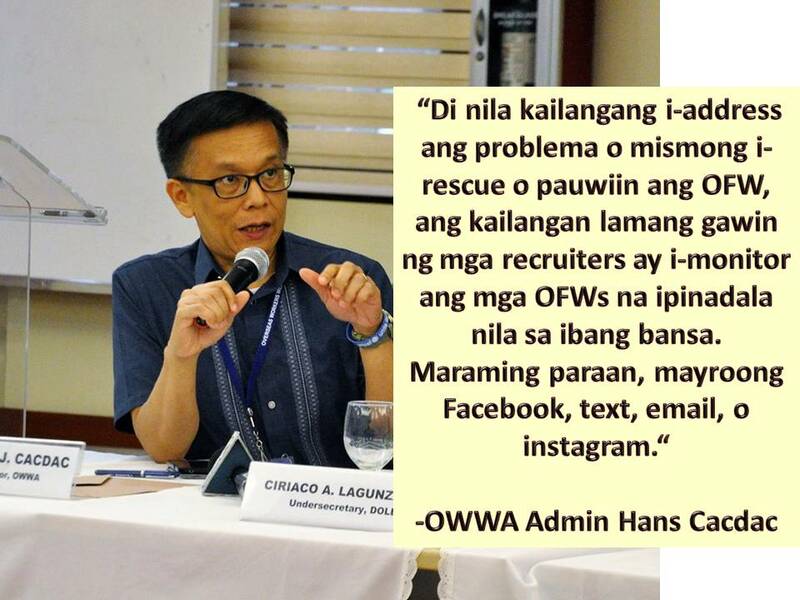 “The saddest thing to hear is when you ask a recruitment agency to step in and help in the rescue effort of an OFW trapped in an employer’s household, the recruitment agency would say, ‘wala eh, sinusungitan kami nung Saudi counterpart namin eh!’ But who brought in the Saudi counterpart in the picture in the first place? Kayo rin di ba? Partner niyo 'yun eh!” Cacdac said.